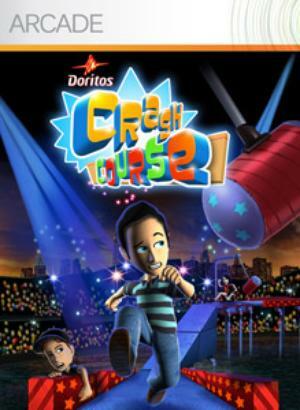 Doritos Crash Course is the second free XBLA game (the other being Harms Way) that was released last month as part of the Doritos “Unlock Xbox” challenge. The game plays out like the summertime game show Wipeout. 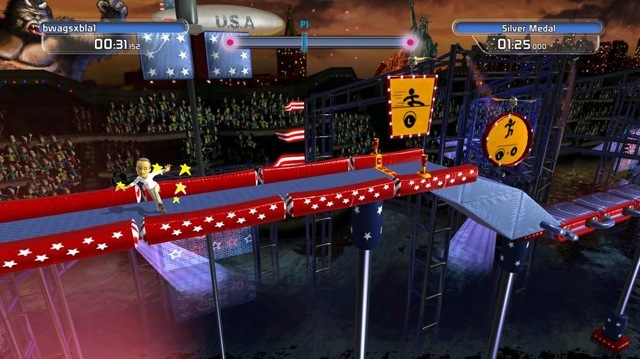 You control your character (which is actually your Xbox Avatar) and play through a relatively short side-scrolling obstacle course, with the goal being to complete the stage as quick as possible. This is fairly easy to do at first, but some of the later levels can get rather tricky. Swinging hammers can knock you into the water, paintballs can slow your progress and push you off, and conveyor belts can send you moving the wrong way, just to name a few examples. There are a fair amount of levels to work through, and this experience is enhanced by playing with a friend. I ran through the game with a buddy online and we had a good time racing each other to the finish line. I did find it kind of funny that you are essentially racing a cardboard cutout of your friend instead of the actual avatar though. In comparison to Harms Way, I have to give Crash Course the slight advantage since it appeals more to a wider audience. Who doesn’t like the idea of an easy to pick up and play type game where you are basically playing a wacky game show? As mentioned earlier, some of the later levels get frustrating but as long as you play with a friend it helps keep the game enjoyable. Crash Course ended up winning the Doritos challenge, and I believe the game’s immediate appeal is what pushed it to the winner’s circle. For a quick, fun party fix, Crash Course is a good option. Played this last week with some friends and we were surprisingly addicted. Simple formula, but it works. Beer definitely helps though. Yeah, it’s not bad. Booze and friends definitely make it better.